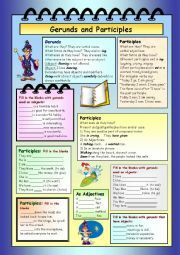 This worksheet is very useful to teach students what gerunds and participles are. 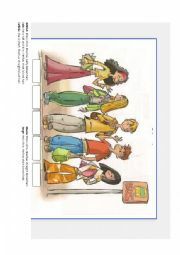 Students read the descriptions and write the correct name of the person being described under the picture. Use of "is" and "has" when describing people´s physical appearance. First, students complete the sentences by using is or has. Then, they have to match the picture with the corresponding description. Students read an e-mail where a person requests a hotel reservation. They have to fill out a reservation chart with the information provided in the e-mail. Students read the Help Wanted Add and answer some questions about it. It is very useful to learn vocabulary about job related content. There is also a matching about positive and negative qualities that people have. It is good to learn about qualities people should have to be a good worker. 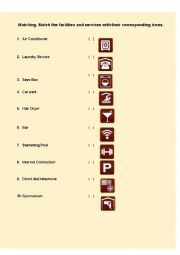 Students will identify the different facilities and servicies offered at the hotels by using icons. 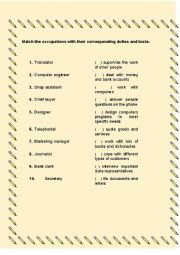 This activity helps students to indentify some jobs and their corresponding duties and tasks.